It’s nice to see whisky, hard wood and jazz bands in some place that isn’t a bloody speakeasy that serves you drinks in blasted tea cups and jars. It’s not fun. Or quirky. Stop. NOLA goes back to bringing coupes, jazz era style and Louisiana drinks into the modern day (PUBLIC) bar scene – and they do it with a bang. 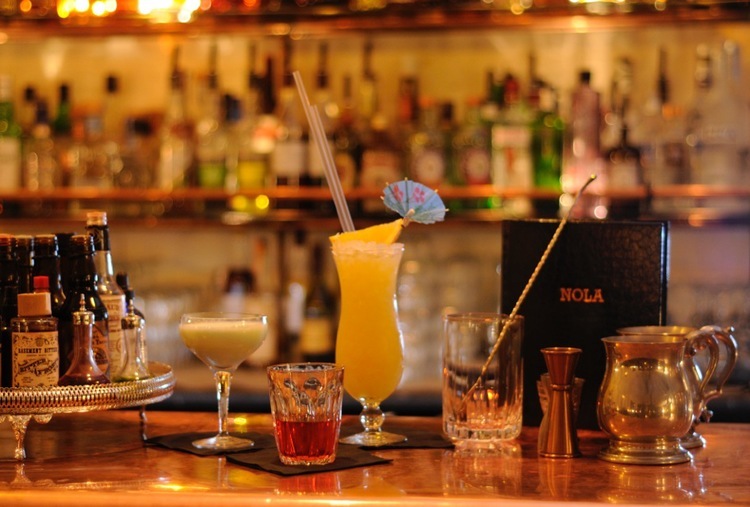 Bringing the bayou to London (as you can tell by the Hoodooist’s nom de plume), is a move he is very pleased with. When first walking in, we had to make sure not to end up at the other bars in the same tiny building on Rivington Street (Bedroom Bar, French Quarter Bar) all linked by the same staircase. NOLA is a small space, but far from suffocating. They cater entirely to table service, to make sure to either book in advance, or cross your fingers. Leather booths and dark wood tables face a bandstand where jazz musicians come in on a Thursday night. 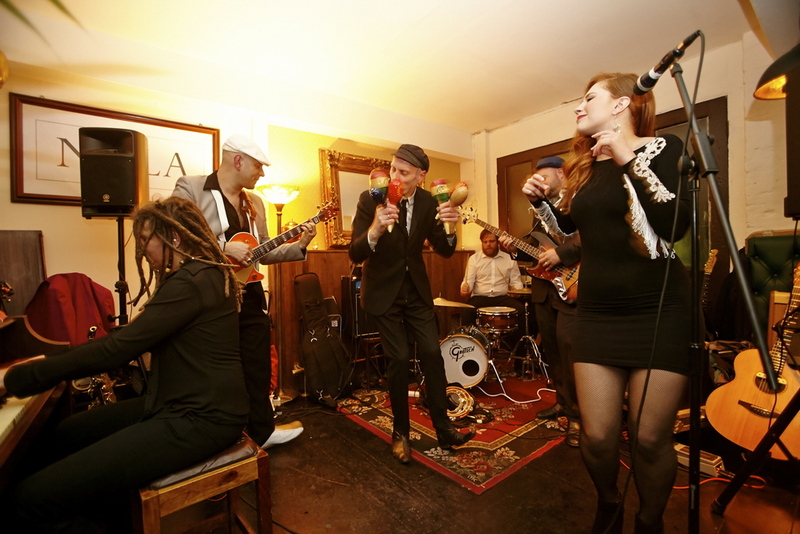 The bar itself is framed by mounted trombones, and fronted by aged bottles and an apothecary of bitters, reductions and various flavourings, in keeping with the voodoo vibe the menu tries to evoke. It has to be said. The classic cocktail selection is enormous, but overshadowed by the stars of the show: the wonderful house cocktails. We see the New Orleans classics like Hurricanes (of which there are several versions served here; usually as sharers, as they should be) and Sazeracs – as well as drinks designed by New Orleans bartenders, or NOLA themselves. We began with the bar’s signature, the Sazerac. NOLA is the only bar outside the USA to win the New Orleans Culinary and Cultural Preservation Society’s “Seal of the Sazerac” and boy, do they deserve it. You have a choice to go for the pre-1870 cognac, post-1870 rye, or blend recipes – the blend is your friend. The Hoodooist was very pleased to see the Sazerac served without ice (a mistake many bars in London make) with minimum garnish. Just simple, warm, inviting like a leather Chesterfield armchair. The fragrance was rounded, its heat sending the scent directly to the head without being harsh on the nose. The flavour was exactly what one expects from a Sazerac. The anise, bitters and the sweetness of the liquors and sugar balanced beautifully with none demanding centre stage (as absinthe usually does). We were hoping the next drinks measured up – we weren’t disappointed. The house cocktail: Gris Gris, was an excellent follow up. Banks 5 Island rum, stirred with sherry and maraschino, finished with spice and injected with smoke. Thankfully not as sweet as we feared; was tart and handsomely dry thanks to the sherry. The spice and smoke really are what makes this drink, adding an aura of mysteriousness to the drink that draw you in from the scent – a better name for this drink I couldn’t have conjured. The VEP Rinse whips out the 12yo El Dorado rum for sweet vermouth, bitters and Chartreuse VEP rinsed ice cubes to make a supremely smooth drink that begins with the rum and ends with a hint of the Chartreuse. The Hoodooist and his table did have an argument over the Black Magic Woman – some loved it, some hated the Blackwell’s dark rum, sweet vermouth, Fernet Branca and crème de violet mix. The primary accusation was its medicinal quality, mine was that it was too sweet. It begins on the crème de violet’s deep sweetness; then the Fernet Branca, which might have been more of than necessary. I like that this exemplifies the subjectivity around cocktail reviews – there needs to be in depth discussion because “This is good/bad” just doesn’t cut it. Finally, the Slightly Sinister was the perfect end to the night. Developed by New Orleans bartender, Kimberly Patton-Bragg, Four Roses Small Batch Bourbon is stirred with quina, cherry and bitters, injected with aromatic smoke over ice. I was pleased to see quina since it is uncommon to find in cocktails in London – a fortified wine on a precarious balance of plum-like sweetness from the fortification, the bitterness of chinchona bark (source of quinine, not a popular flavour these days, sadly – as Kina Lillet noticed) and the herbal flavours of gentian – goes very well with bourbons. The quinine is the first flavour to encounter; then the drink is sweet, without being domineeringly so, which is what makes it a great last drink. Not dry like the Gris Gris, but sharing the inviting scent from the smoke. Although the drinks reviewed here are primarily short and intense, you will find a large selection of longer drinks on the menu, do not fear that. And that’s a wrap! NOLA still ranks as one of the Hoodooist’s favourite haunts, regardless of the Mardi Gras hiccup, because it just is that good. 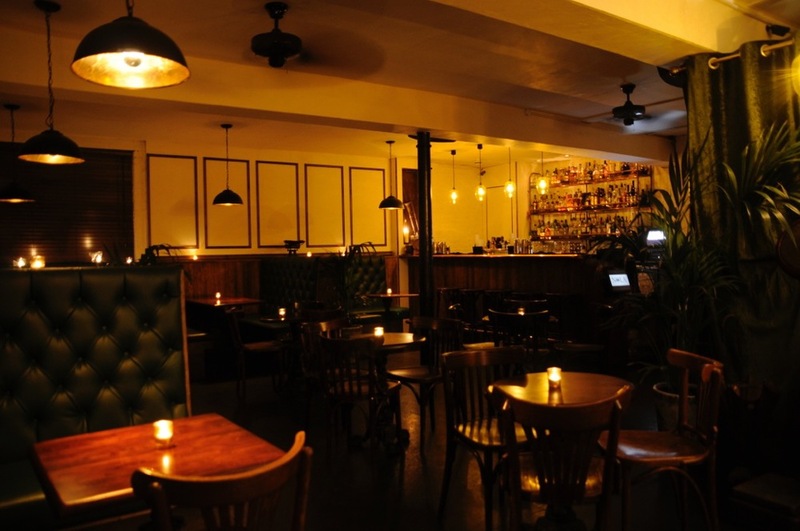 It’s good to see a success story on the same street as the famous Callooh Callay and rival it with such vigour – moreso now that we are expecting the wonderful PortSide Parlour to dock there as well. Everyone’s going to have to start upping the ante, I suspect. This entry was posted in Bars & Cocktails and tagged Cigars, New Orleans, Sazeracs, Small Groups.